can someone hapend to anime galleries . Gundam mad little brother - "red"
All they did was modify the look slightly its alot like atari age now. Plus you can use your own avatar! It just takes a bit of getting used to. but i think i got the hang of it now. You will give it about 20 minutes you can get used to any thing. Poem like thing "A place Tis what i seek"
The clan is full so don't bother unless you want a new user title. *gets up rubbing his head* This is really weird, I agree. I can barely navigate the site. hmm...anyone kno if the poet society is up? Wasent the old fotum blue? Or purple i mean this color is not that diffrent. This is the first forum that is back up. AG.net and Tuxy should be back up shortly. Until then...you'll just have to be patient. 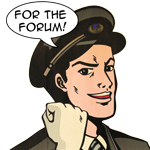 The poet society will return once AG.net forums are back up. Okay? Ah! What the fooz happened? Have some mad scientist opened a portal to hell here as well?